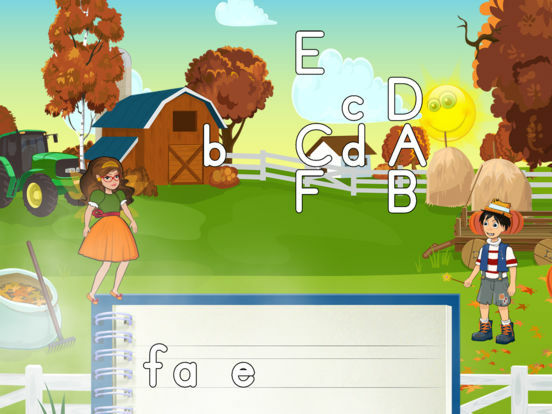 This is an app that has been created with home schooling young children in mind. Having said that the app is aligned to the United States Common Core State Standards of 2017 so it can also be used within the classroom setting as well in the home for parents wishing to help build on their child’s education in school. The app is game based and encourages young children to learn through storytelling and interactive problem solving whilst learning letters, sounds and the shapes that letters make. From browsing the developer’s website it is clear to see that a lot of time effort and thought has gone into producing this app. There is a small counter at the bottom of the page that lists the fact that 18253 hours have been spent working on the app and this includes 261 different versions that have been tested. As someone looking for a sense of quality in an app it is also extremely good to see that 203 experts have also been used throughout the creation of this app with 201 teachers also being a part of the process. The app is also aligned to the United States Common Core Standards which again adds further weight to the quality of the app which would please both educators and parents wanting to use this app. The website actually has a large amount of content on it that explains a lot about the app and how to get the most out of it. This review is for the free version, however there is a subscription based paid for version where there is a lot more content and some of this is accessible via the website. These include things such as webinars and training sessions as well user guides and access to an online support community. As already mentioned the app is aligned to the Common Core State Standards of the US so it a US based app, however it can be used in other countries as it does have a lot of quality content to it. The app was originally designed for the home schooling market and although this is a perfect app for that it can be used in a number of different ways including in the classroom setting and also by parents wanting to help do their bit to help their child’s education alongside their schooling. The design in terms of visuals and sound is well matched to the age range that would access this app. It is extremely clean with some really good animations and pictures that would be worthy of any award winning picture book. The game play is also extremely smooth and very intuitive meaning that there is nothing to stop users from returning to the app and nothing to distract their learning too. This version of the app has a lot of content available and once the user enters the app they are able to see all of this and begin learning from straight away. This can either be done by following the natural lesson progression or by selecting the lesson that the user wishes to access. The content that is available includes all the introduction to all the letters of the internet and two separate exercises. The letter lessons take each letter in turn (unless you choose otherwise) and guide you through learning the letters and the formation of each of the letters. You can choose within the settings whether this is upper or lower cases. This means that technically there are 52 lessons as you can work through both upper and lower cases in turn. The user is lead through the lessons by a problem solving fairy who asks the user to help her solve problems as she moves along her story. This includes helping someone collect up apples, or cutting brownies by tracing the letter formation. The user must repeat the actions, thus helping them learn the formations before they can character can be helped. The app is extremely engaging and helped by the great design the gameplay is sensible and smooth meaning that the user is hooked in but also, most importantly, the user can move through the app helping the fairy solve problems and not even realise they are learning! Outside of the learning within the app there are also a number of other features that really adds value to the app. For a free app you are able to have three separate children with accounts and these can be selected throughout. A scorecard also gives a whole host of information within it. This includes selecting the days that the user has accessed the app and then how many times they attempted and completed lessons as well as the success rate within. This includes a breakdown of 12 different criteria showing how successful the user has been. This means that any learning can be personalised as an educator is given a mass of information to help them understand where a user may be struggling and therefore how they may well be helped. Overall there are so many individual things to love about the app however the fact that they are all together in one app and work so well together makes this a fantastic app. ABC Book Homeschool is built by educational professionals & homeschooling parents and has NO advertising, pop-up adds, or links to other sites, so that our kids can learn in a safe & engaging environment. Visit our website for additional materials like Standards Correlation, Pacing Guides & printable Portfolio Materials and other materials needed for your Annual Evaluation. App is intended for use by children of ages 3-8, in preschool, kindergarten and 1st and 2nd grade of homeschooling & elementary/primary schools. Kids can work on their own, or together with parent/teacher. In FREE mode - 10 lessons are available. Log in for more! 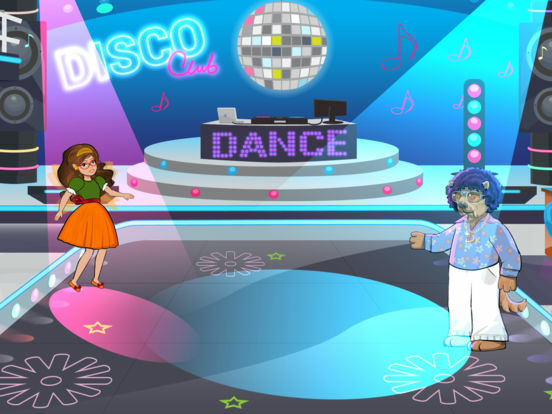 - This game will teach the kids to do simple writing tasks like drawing lines, circles etc. which are important for later letter writing tasks. 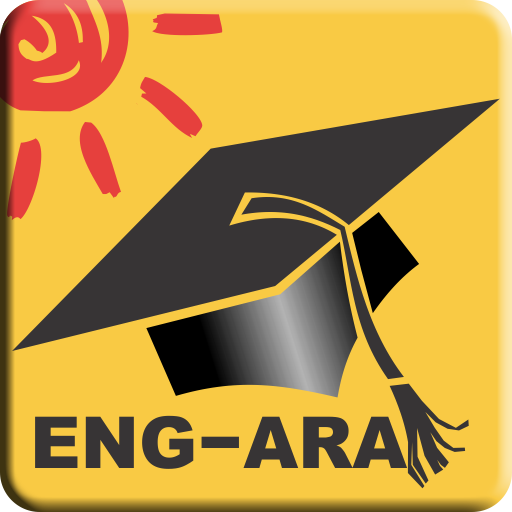 - In this game students are expected to complete the given word, in which one of the letters is missing. 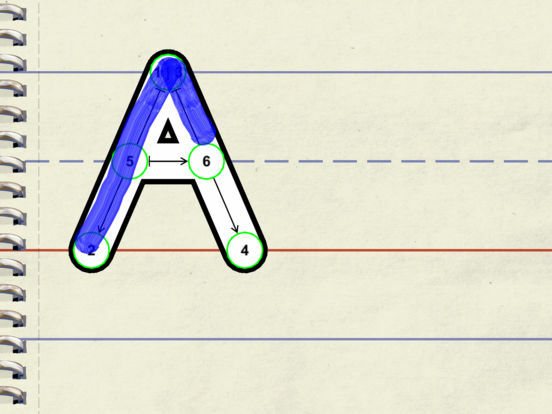 All the letters students have learned so far are shown, in both upper and lower case, and they need to drag the correct letter in order to complete the word. 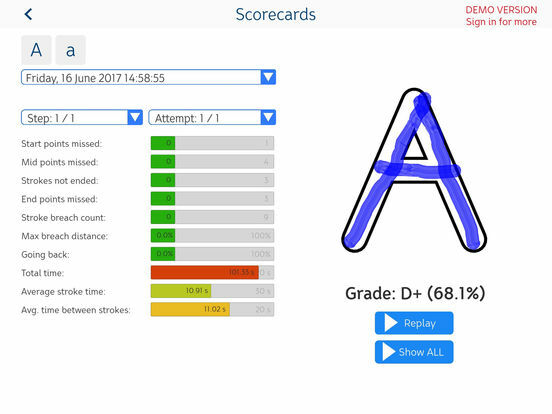 - Detailed Scorecards will show you not only the end result, but also your child's progress towards it. Application will replay you your child's writing attempts, and show you where it needs to improve in a visual, easy to digest manner. - At an early age it is important not only to learn how to trace letters with fingers, but also to learn how to properly write and be able to reproduce the same results on paper. This is why our special system allows kids to write letters with rubber tip & fine tip stylus pens for iPads and keep the full motor development for writing. 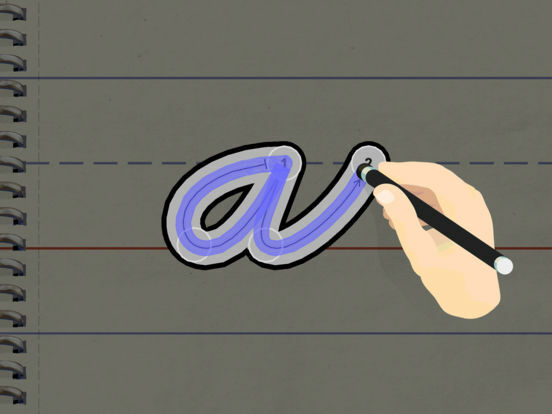 - During the letter-writing practice, app analyzes each writing attempt in real-time, marking different mistakes if they are made, and adapting task’s difficulty to meet student’s individual learning pace & style. - As parents, we understand that, sometimes, you can simply get stuck. This is why we have created webinars and on-demand support for our users to help get back on track and homeschooling in no time. Don't forget to visit our website for additional materials like Standards Correlation, Pacing Guides & printable Portfolio Materials and other materials needed for your Annual Evaluation. Internet connection is required only to access each lesson for the first time. Once the content is cached, Internet connection is no longer necessary.